The 500-page novel is richly illustrated with ten maps and more than three dozen images, providing the reader with a delightful insight and scrutiny into this lesser-known man of the fur trade. 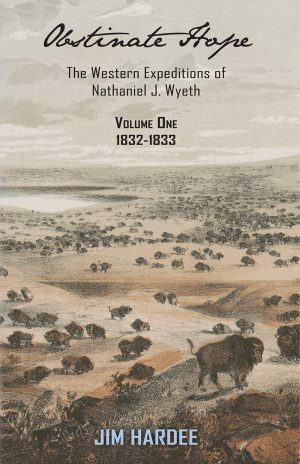 Volume 1 – The story of the 1832 Expedition of Nathaniel J. Wyeth. Obstinate Hope: The Western Expeditions of Nathaniel J. Wyeth, Volume 1, is part one of a two part examination of the life of Nathaniel J. Wyeth. The book begins with a look at Wyeth’s pre-fur trade life including his heritage, operation of the family’s Fresh Pond Hotel and his early career in the ice industry. The bulk of the book details his first expedition to the west (1832-1833) using his letters and journals as its base. The narrative follows Wyeth on his trip to the fur trade rendezvous in Pierre’s Hole, on to the Pacific Northwest and then back to the East coast. Each of Wyeth’s journal entries are accompanied by the author’s commentary, providing insight into Wyeth’s experiences. The story is supplemented with information from the journals and letters of other people who were with him for all or part of the trip. The commentary also compares what Wyeth encountered in the west with events and occurrences from other trapper diaries. Ten maps and more than three dozen images illustrate the text. This entry was posted on November 15, 2013 by Gliffen Designs.